Today’s Throwback Thursday examines what not to get yourself for the holidays. 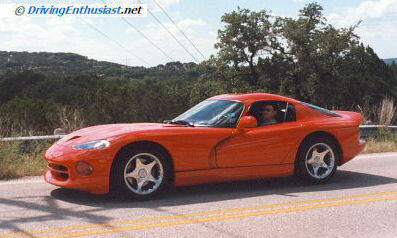 The following are the original words from 1998 of our road test of a 1997 Viper GTS. When we wrote it back then, daring to expose the Viper for what it truly was (call it “the Truth about the Viper”), we received a death threat email from an unnamed California individual who had spent his entire 401K on buying himself one. How dare we insult the greatest car ever made! Now, with the latest Viper not selling very well (thank you, C7), it’s time to remember our own time with a Viper that was representative of the middle years of the product. 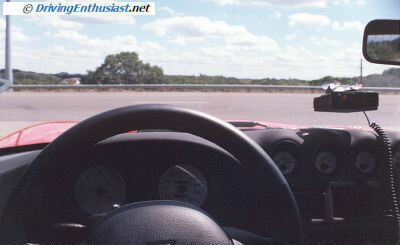 Our 400-mile road test of a 1997 Viper GTS in August 1998 gave a friend and I an opportunity to get familiar with the personality of the car, it’s driving characteristics, and it’s livability. This was a new 1997 model, immaculate and carefully cared for, and with only 1100 miles on the odometer. We took it on a trip from Austin, TX to Texas World Speedway and back. 8 liter V-10 (aluminum-block version of a Dodge truck engine), but only 450 horses, 490 torque. Oddly (with visible results at a certain SCCA Runoff!) there is no windage tray or baffling in the oil pan! Michelin 17″ wheels: 335s rear, 275s on the front. Bright red w/chrome wheels (thankfully not the orange-yellow painted wheels some Vipers have). No stripe on this car. 13 inch brakes all around – 4 piston front calipers, single piston rear – NO anti-lock. Costs range from $60-70k (used GTS: typically under 60)! The temperature on the day of our road test peaked at almost 120 degrees, bringing out the worst of the car, and showing us what the inside of the car during a fast session on track would be like. In a word: “FAIL“. We found that the Viper was a very poor “car” and a not very proficient “toy”. Tons of power, awesome and phenomenal horsepower. But tricky handling, and absolutely unlivable. An expensive lesson is here to be learned, best summed up with some words from classic Star Trek: “After a time, you may find that having is not so pleasing a thing, after all, as wanting. It is not logical, but it is often true”. I’ve driven a wide range of different performance cars over my years of racing and instructing and I was really expecting a lot more from this car. At the start of the day, we hoped to enjoy the drive. But as we drove further and further, the car’s real problems came out and we began to feel let down. Walking around and looking under the car, you’ll notice a couple of things. First, the factory build techniques aren’t very sophisticated and the quality is terrible – even a period Taurus is built far better than this car. The joints are mostly all straight, the hood (semi-clamshell) fits well. However, there are lots of panels bolted on – instead of bonded. The hood “fluttered” at speed. It seemed to have a “wave” pass thru it when going over short choppy bumps. The rear window is bonded onto a crossmember between the two hinges, and it was already loose – when the bond lets go altogether (soon), the rear window will fly off the car. Closing the hatch stresses the bond and makes it even worse – a very poor design. Inside, there are leather high-back buckets, very low on the floor, with little side support or bolstering. Soft padding – not like the best Recaro seats would provide. They adjust fore/aft roughly 4 inches, and recline just a very few degrees. A very high console runs up the middle of the interior, and the sole interior storage is a very small lockable box just behind your elbows. Several mesh nets around the cabin – on the seats, roof, above the lockable storage. These nets were a smart idea that I’d like to see elsewhere. The drivers position is so poor that your head ends up resting right on the section of roof above the window. I’m about 5’11”, and if it wasn’t for the slight bulge in the roof I couldn’t wear my helmet inside this car. 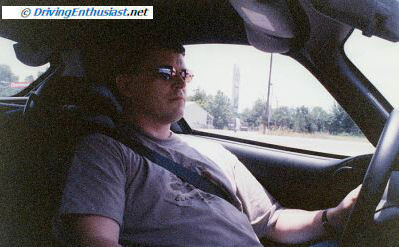 You right leg has to rest against the console – the gas pedal is right up against it. Your left leg has to be held above the clutch – there isn’t room for a dead pedal! Both knees are therefore resting right on the steering wheel. Driving in this weird position, I was only able to last about 80 miles before I had to literally get out of the car because of a huge leg cramp. Strangely, the passenger seat is a lot more comfortable. The steering wheel is big, fat, leather wrapped, and tilt-adjustable. It really needs a telescoping feature: it angles off somewhere the right; you are jammed in the seat towards the left; and it just gets worse given the terrible pedal position. The pedals use a trick system where they can be adjusted fore/aft. However (and you’ll see me use this word a lot in this report), they needed to be farther forward for me to fit. Unfortunately, they couldn’t be adjusted any further forward – the clutch pedal has to be pushed in so far that the pedals couldn’t be moved any farther forward. Worse yet, the pedals are not in the same plane; there is no dead pedal; and there is an enormous gap between the gas pedal and the clutch pedal. The air conditioning system is completely insufficient, ridiculously so. There are three small rectangular vents in the middle of the instrument panel, and a round vent on each side of the panel underneath (none on the sides of the dash). The slightest acceleration cuts the air conditioner out – which means it is very often blowing hot air. There is also a tremendous amount of hot air coming into the interior from the transmission, the exhaust on each side, and from the engine up front. The factory stereo is terrible, and can’t even be heard at any engine RPM or speed. Forget about speakers – wherever they were they didn’t work at all. The antennae is built into the windshield (GM style) and also doesn’t work very well. Modern engines are quickly moving towards 100 horses/liter. Today’s well tuned naturally aspirated engines are making at least in the neighborhood of 80 horsepower/liter or more (pushrod engines less), with one or two exceptional standouts making over 120 horsepower/liter. Not this throwback – it has a horsepower per liter rating lower than a Neon. Throwback isn’t even the right word. Oddly this engine is tuned for mid-rangepower – not low end and not top end. It doesn’t feel like a “tractor” 4.9 liter Mustang engine at all – you have to slip the clutch a bit to get it moving. You’d think it would have massive low-end torque, but it doesn’t. It’s midrange tuning makes this engine very strong in the 60-120 range: passing slow moving cars on the highway to TWS was, ahem, “not a problem”. This engine runs extremely hot – it started at 195 degrees and spent most of it’s time above 220 (typically 240). The temperature will raise sharply if you decelerate and drive at normal speed thru a town, or get stuck in traffic. As the engine got *very* hot, it started to detonate slightly between shifts. The engine did not loose any fluid. An idle speed of an indicated 500 RPM means a lot of rumble and noise while sitting in your driveway or holding the clutch in at a stoplight. Don’t take this to mean it has a wild cam. Because of it’s tuning, at part throttle it’s actually docile. The Viper has an absolutely terrible exhaust system – I’ve heard it referred to as a “Miata on steroids”. It doesn’t sound like a proper V-10 or V-12 and it certainly doesn’t sound like a V-8. Just like the original Viper RT/10, the exhaust system is routed along the sides of the car immediately below the side door sills – but in this case it exits out the back. It is so hot after any amount of driving that Chrysler felt they had to warn occupants against touching the sill by placing a sticker on the passenger side door opening. Excellent advice, too, because it will burn you. Lets talk brakes. The fr/rr brake balance is very poor – the owner had even locked it up in the front a couple of times. The pads created an incredible amount of dust: the wheels were literally black from this short drive. The brake pads became seriously hot, leading to the wheels getting burning hot to the touch, resulting in a noticeable amount of brake fade (noticeable, not dangerous). The T-56 transmission was as good as they came back in these days, but seemed a bit more vague than usual. It definitely needed an aftermarket shifter – trying to shift into 5th after passing somebody in 4th was very difficult. Surprisingly, there was a lot of driveline slop, with a noticeable degree of take-up in the differential at speed – very much like a worn solid-axle Mustang. 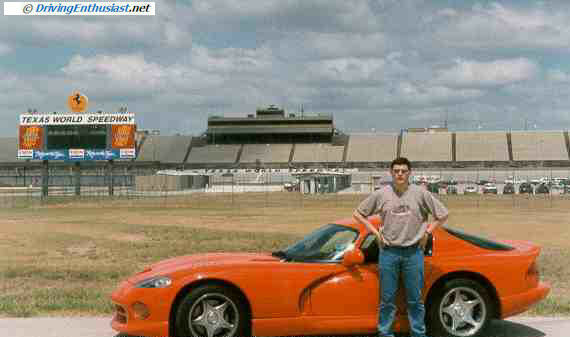 We started the drive happy with our fortune – it isn’t every day you can borrow a Viper to go see a race. As the day went on, we got less and less enthusiastic about the car. It was hot, it was a huge pain in the neck (and legs, and lower back), and it was a fight to keep it pointed straight down the road. This isn’t a car that could be used for a daily drive, much less any kind of touring drive. You certainly couldn’t stand to drive it to the track, it would have to be trailered. Once on the track, you’d find that the very poor driving position would be a serious detriment to concentrating on your driving. Nevertheless, if you can avoid it’s inherent tendency to spin, you can turn excellent lap times. Now for the obvious un-PC question (the one that matters to the owners) – was it a “babe magnet”? Yes, unquestionably, and more so than just about anything else you could drive (ok, a Lambo would have been better). Needless to say, there were any number of “opportunities” today. We had to stop several times to get some cold drinks (dehydration being a major problem in this car), and many people came walking up to the car to look it over and imagine themselves inside it. In the early morning, while stopped at a McDonalds, a lady stopped in her Jaguar Vanden-Plas to admire the car! Oddly, she was wearing a fur coat – and it was already 100 degrees outside. What single factor about this car that makes the biggest impression? The engine of course, but it’s also a weak point of the car. Couple that with the terrible interior and you can’t even drive this car as fast as it could be driven. Verdict – spend your money elsewhere. Your can easily find one of these for $35-40k (at the time of this writing), but you can also find a C6 Z06 for $40k. And you can live with a Corvette a lot easier than you can with this. The Ultimate S2000 Swap? Viper V-10!